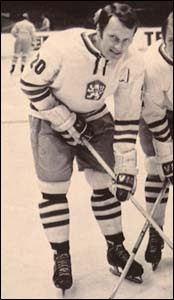 Four-time Olympic medalist JIRI HOLIK (20) of army club Dukla Jihlava and VLADIMIR MARTINEC (10) of Tesla Pardubice, who was selected as an All-Star at the annual IIHF World Championships four consecutive years from 1974 thru 1977, combined to score five goals for CZECHOSLOVAKIA on the opening day of play at the 1976 Winter Olympic Games. Three-time world champion CZECHOSLOVAKIA showed itself to be a bona fide contender for the Olympic gold medal by completely bulldozing Eastern Bloc rival and C Pool contestant BULGARIA 14-1 at the Olympiahalle on the first day of the qualification round for the ice hockey competition at the 1976 Winter Games at Innsbruck, Austria. Three goals each from the Tesla Pardubice tandem of VLADIMIR MARTINEC and JIRI NOVAK as well as two goals apiece from the army club Dukla Jihlava duo of JIRI HOLIK and JOSEF AUGUSTA powered the Czechoslovaks, who were determined to shake off the disappointment of having won only a silver medal at the ’68 Grenoble Games in France as well as just a bronze medal from the ’72 Sapporo Games in Japan and, finally, topple the three-time defending champion Soviet Union to claim Olympic ice hockey supremacy. The overwhelming result against Bulgaria matched Czechoslovakia’s lopsided win over Poland at Sapporo in 1972 by the exact same scoreline and tied as the country’s second-largest margin of victory at the Olympics since the Czechoslovaks, with a squad that included the now 31-year-old veteran Holik, had squashed Japan 17-2 at the Olympiahalle in the qualification round for the ’64 Innsbruck Games a dozen years earlier. 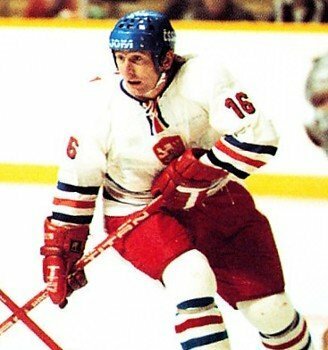 Czechoslovakia Olympic captain and SONP Kladno defenseman FRANTISEK POSPISIL, who would soon become the focal point of so much attention for failing a post-match drugs test at the ’76 Innsbruck Games, in addition to the CHZ Litvinov pair of defenseman JIRI BUBLA and center IVAN HLINKA, both of whom would eventually compete for the Vancouver Canucks in the National Hockey League, all added a goal and an assist apiece in the rout of Bulgaria. 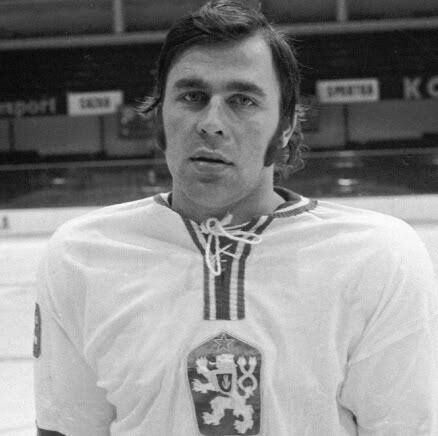 EDUARD NOVAK of SONP Kladno, the 29-year old winger who would soon enough score what looked to be a most important goal against the Soviet Union late in the third period of the de facto Gold Medal Match of the ’76 Innsbruck Games, was the other Czechoslovak to put his name on the scoresheet on the opening day of Olympic play in the Austrian Alps. Curiously enough, despite the one-sided nature of the contest, not one single penalty infraction would be called by either of the two Austrian referees, KURT HAIDINGER and WILHELM VALENTIN, overseeing the international match on home ice at the Olympiahalle in Innsbruck. Bulgaria managed its only goal when MARIN BACHVAROV, who still stands second all-time having scored 46 goals for the national team at the World Championships and Winter Games, cut the deficit to 7-1 and spoiled the shutout bid of Czechoslovakia netminder JIRI CRHA, the 25-year-old Olympic rookie from Tesla Pardubice who would eventually defect to the NHL’s Toronto Maple Leafs, with just under four mintues remaining in the second period. 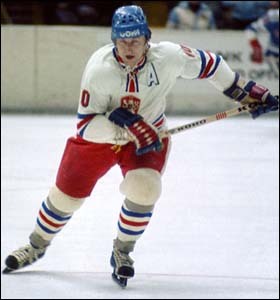 26-year-old defenseman JIRI BUBLA of CHZ Litvinov, who would be chosen as an All-Star at both the 1978 and 1979 IIHF World Championships before ultimately appearing in 256 NHL games over five seasons for the Vancouver Canucks, scored what proved to be his only goal for Czechoslovakia at the 1976 Winter Olympic Games during the decisive 14-1 triumph over Bulgaria in the qualification round.